"Learn, Step-by-Step, How To QUICKLY And EASILY Play All Your Favorite Worship Songs By Ear... No Sheet Music Required! In less than five hours, I'll take you by the hand and show you how to play songs like "Anointing," "Thank You Lord," "As the Deer," "Hallelujah," and others --- by ear! Plus, you'll learn the secrets behind how chords, progressions, and patterns are formed --- which means you'll have what it takes to easily learn new worship songs BY EAR on your own! I am literally a few seconds away from revealing to you the same techniques and secrets that I've used for over 12 years to learn absolutely every worship song I've ever wanted to play on the piano, organ, or keyboard --- in a matter of minutes! And I'm going to show you, step-by-step, how you can do the same thing with all of your favorite worship songs - whether contemporary, traditional, or urban-styled! No sheet music or memorization needed! No complex theories. All material is easy-to-understand and can be applied immediately! No huge experience necessary! As long as you can find "C" or "F" or "G" on the piano, you'll be fine. ...And it's not as hard as you think. What most musicians don't realize is that chords are recycled over and over again in song after song! In the last 12 years of playing, I've never (I mean NEVER) had to learn or "invent" a new chord progression. I've learned new "licks" and "tricks" but the patterns have forever remained the same. "I had been playing for 11 years and still couldn't follow worship leaders and soloists in my church. I would always hide behind the organist but wouldn't dare play by myself. 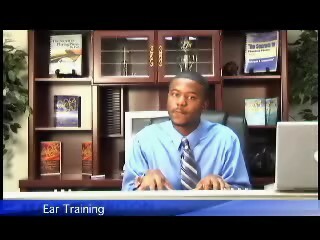 Then a friend of mine told me about Hearandplay.com and how they were teaching gospel music. So to make this real short, I started working with your resources and made up in my heart that I would be serious about my playing and in about 2 months, I began to pick up songs all by myself. I've learned about a dozen or two songs and am constantly learning new ones each week. I no longer feel the need to hide behind another musician and am building my confidence because of HearandPlay.com. This is a Godsend. Do you have a strong desire to do any of the things below? "I want the ability to..."
Play any gospel song I hear without relying totally on others, sheet music, lead sheets... or getting the chords from the internet. Play the piano, organ, or keyboard for my church choir, singing group, or worship service. Lead worship service at my church, but also be able to play the piano or organ when I'm available. Accompany singers or soloists no matter what song they sing --- or what major or minor key they happen to be in. Be all that God wants me to be as a gospel musician in ALL areas. If you chose more than one of these desires, then it makes sense to keep reading this letter. ...I'll tell you why in a moment. How to take small little chord progressions that I call "couples" AND turn them into complete worship songs in just minutes --- it's very simple to master. How to learn slow-paced, harmonious worship songs like "Anointing," "Thank You Lord," "As the Deer," "I Love You Lord," and others... ALL BY USING small little chord progressions called "couples." Once you've learned the secrets to "coupling," you're gospel playing will never be the same! If so, then let's get right to it as you're about to learn in five hours what it takes musicians to learn in years of trial and error. Gospel music is all about patterns, my friend. If you ask any experienced musician about learning new songs, they will agree that the same chords are used over and over again in song after song. I wish I could brag about how I learn every new chord "that comes out" but you know what ...? Chords don't come out. Progressions don't come out. They've been here for decades and they will always be the same. New songs will come out with different combinations of chords but what it all boils down to is getting to the point where you can recognize recurring patterns within any song. These small patterns ... or chord progressions ... or "couples" will enable you to learn any song by ear --- regardless of how complex you think the song is. See... once you've determined which patterns are at work, the next battle is to determine what major key the song is being played in. There are twelve major keys just like there are twelve major scales. A song can only be in one key at a time. Songs may change keys (for example, from "Db major" to "Eb major") but can only be in one distinct key at any given time. And trust me... as you listen to a song, you should be able to hum (with your own voice) this key out loud and it should fit in at all places during the song. Next, you'd basically transfer what you are humming to the piano and find the single note that matches your voice. This is what I recommend for people just starting out. Experienced musicians will find the major key of a song within 3 seconds without humming but there has never been a time I haven't been able to help a beginning musician understand this concept of key signatures. I'm going to repeat myself time and time again. SONGS OPERATE BY PATTERNS and until you learn to recognize these patterns in songs, you'll be in the same boat. Asking people for chords to new songs will only help so long. There will come a time when you're going to have to step out on faith and learn these songs on your own. ... And I'm here to tell you that it's not as hard as you think. 1. "The Reason Why We Sing"
3. "Praise Is What I Do"
4. "Jesus, At the Mention Of Your Name"
5. "You're the Only Living God"
6. "Praise The Lord With Me"
7. "O, Give Thanks Unto The Lord"
Note: Sure there are different variations or ways to play the chords above depending on the song, but just remember that the pattern "Db --- to --- F --- to --- Gb" will remain the same. 3. "I Really Love The Lord"
My friend ... I'm not talking about huge chord progressions that take months to master. I'm talking about small groups of chords, that, when used together, create beautiful worship songs. You've seen two examples of how you can literally take three chords and play several different songs. And if you've caught on already, now you realize how many other songs follow these same patterns. If you let me, I can show you step-by-step how to play worship songs by ear. These are not difficult rules. These are not complicated techniques. They have been used by musicians for generations after generations (though they might not have been explained in the sequential steps that I am going to show you). "I have to admit. I was one of those people that would post help ads on websites asking for chords to this song and that song. I just couldn't figure out these songs on my own no matter what I did. I had no structure to my playing and I'm not ashamed to admit it. That was before I came across HearandPlay.com. Your videos have helped me to understand how gospel music is structured and I can't exchange anything for this knowledge you've given me. It feels good to learn songs on my own now instead of bothering other folks for chords all the time. Now I'm glad to be helping people myself." I played the violin in my youth but had been out of touch with music for several years. At my church, one of the ministers decided to start his own church so many of the members and musicians left to support him. We still had many members left but no piano player. For about 3 weeks, we went without music. Then God spoke to me and gave me a strong desire to take up the piano. So I began to research online and came across your website. It was something about this website but I just couldn't explain it. Then I got your videos on praise songs and I could just feel the anointing on your life. That video started it all for me because those were the same songs we sang at our church. I practiced it daily as much as I could and soon I started playing my bass lines. Then my right hand came together after some more practicing. Now I am playing many praise songs and am waiting for your worship video. You let me be the first to know when this one comes out because you don't know how much you've helped me. You be encouraged young man and keep enlightening the people of God. * Discover my seven sets of couples and how to use them to play absolutely any worship song you want. I reveal seven different categories with several chords in each. Once you've mastered these chords and how to connect them together, your piano playing will never be the same! * Learn how to form tons of different couples by just knowing a few select chords. You don't have to know hundreds of chords to play gospel music. In fact, all you really have to know is a few major, minor, dominant, and diminished chords, and let the power of "patterns" take over from there. Think about it? If I told you to rearrange the numbers "1", "2", "3", "4", and "5" as many ways as you could, you'd have more than 120 combinations. Well, the idea of "couples" is the same way. * How to predict what chords will come next while learning a new worship song. Again, chords don't occur randomly. You'll learn exactly how to predict what chords to play next based on what you've already played. This won't require lots of thinking once you catch on to the concept! It's really simple. * How to contemporize the chords you already know by adding "ninths" and "thirteenths" to your bag of tricks. There always seems to be this "x factor" that no one can explain. "If I'm playing the same major chord as this other musician, then why does he sound better than me?" There's a little finger trick you'll learn that will instantly modernize all of your major chords. You don't want to miss this one --- trust me. * Discover one chord that is used in probably 60% of gospel worship music. All chords are not created equal. Some chords are used far more frequently than others. Not only will you be equipped with this one chord but you'll learn tons of chords like this --- chords that reappear in song after song. I will also show you how to pick out this chord in all of your gospel recordings because its definitely there (whether you hear it or not). * An "over-the-shoulders" look at exactly what I do with my left hand. Many people struggle with things to do with their left hand. I will show you several different power chords to play as well as several left-hand arpeggio patterns that will easily compliment your right hand. * Several "licks" and "tricks" that are ready-to-use the minute you turn off the tape. If you've always felt like you're repeating yourself or that you lack creativity, worry no more. I'm going to show you all types of little "licks" and "tricks" that will be sure to enhance your slow worship songs. "I may not know everything there is to know about the piano but what I do know is that now I'm playing for my church service. I've had a strong desire to play piano and for years, I watched musicians come and go, but never stepped out on faith and got started myself. I couldn't really afford a piano teacher and when I did use one, the whole idea of playing nursery rhymes wasn't interesting to me, so I stopped. It's now been 18 months since I've been learning with you and I can truly say that this has been the best investment I've ever made in myself. You are truly a blessing to many people. Add new "licks" and "tricks" to your worship music by next Sunday. Your entire church will turn their heads in awe ... YOU'LL SEE! * Learn what I call my "7-couple" formula to playing tons of worship songs by ear! Just like you learned 5 steps to playing praise songs in GospelKeysTM 300, I will show you easy-to-understand steps to understanding how worship and slow songs are arranged! * Discover my "3-4" principle to playing literally any worship chord progression by ear ... INSTANTLY! Chord progressions don't occur randomly. Certain chords lead to others and with this 3-4 calculation that I'm going to reveal, you will never ever have to guess where to go next! This has never been taught this way before! * Learn over 60 new voicings, chords, progressions, and fancy arrangements to playing worship music! From fancy inversions of the ninth chord to the secret "Quartal" chord (which sounds very very smooth), you'll learn how to replace all of your basic triads and 3-fingered chords with full-sounding 9ths, 11ths, 13ths, and altered chords! Believe me when I say: "Others will notice!" * Learn contemporary and alternative ways to playing worship favorites like "Anointing," "Thank You Lord," and others! While you'll be taught, step-by-step, how to play various songs by the end of GospelKeysTM 202, you'll be equipped with the right chords, progressions, and "couples" (see below) to play over 95% of gospel worship songs by ear! But what you have to realize is that most songs use the same progressions over and over in different ways. GospelKeysTM 202 *Special Edition* will show you how to recognize these changes in songs! Believe it or not ... The same chord patterns are used in all of their songs. * Learn patterns (or what I'm calling "couples") like: "1-2, 1-3, 1-4, 1-5, 1-6, 1-7, 2-5, 2-6, 3-6, 3-4, 4-5, 4-3, 4-6, 4-7, 5-1, 5-2, 5-4, 6-2, 6-7, 7-3, and many more! Don't be intimidated by the numbers. They are simply taken from major scales. The power in understanding all of these couples is that once you know them all, there will be absolutely NO SONG you won't be able to learn! These patterns are in 95% of all gospel worship songs and you'll know them after studying this course! * Train your ear to recognize these small "couples" with specially designed ear-training sections of the video course (one-on-one with me)! Once you've mastered all of the "couples" above, then you must be able to recognize them in songs! I will constantly test you right there on the screen without you seeing the notes that I am playing in an effort to help you build your ear skills! 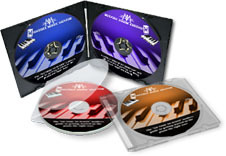 Are you ready to take your piano playing to the next level? Are you ready to start learning worship songs by ear *on your own*? My GospelKeysTM 202 *Special Edition* Series video course (5 hours) will teach you everything you need to know to play just about any worship song you can think of. I won't spend time showing you EACH AND EVERY slow worship song. Rather, I will spend time showing you the basic rules that'll allow you to MASTER hundreds of songs. Yes, I will cover several songs in the video but these are meant to show you EXACTLY how to play all the other songs that follow these same patterns and "couples". The first part of the course is focused on teaching you all the chords you'll need to know to play a majority of worship songs. From personal experience, I've found these same chords to be present in just about 4 out of every 5 songs! What most gospel musicians fail to realize is that chords are recycled and played over and over again in different songs. So part one focuses on getting you up to par, teaching you all the chords you need to know to get started (both basic, extended, quartal, and more)! Lots of content (various chord voicings, inversions, and demonstrations) has been added to this section and it goes beyond the basics --- you get a whopping 80 minutes of step-by-step, over-the-shoulder instruction here! 1 hour and 25 minutes of step-by-step, over-the-shoulder footage of what I play the most during worship services. Not only will I "show" you what I play, but I will make sure you understand "why" and "where" to use these "couples", chords, and progressions. Over seven segments of useful information and examples. I break each type of worship chords into segments. Every single minute of the course is used to share needed concepts and techniques. *Advanced chapter markers and dvd menus available on all discs for easy viewing. Once you've mastered the chords and voicings from part one, you'll learn, through a series of ear-training tests, how to differentiate between certain sounds. I'm going to show you how to determine what types of chords and progressions are being heard so that you skip all the mistakes that most musicians make when learning new songs! You'll also learn how to pinpoint patterns in chord progressions and how to predict what's coming next in a song. I've taught this technique to thousands of people and they've benefited greatly from knowing exactly which chords lead to other chords! Music and progressions are circular and I'll teach you just how to master this circle of chords and patterns! Then, to top it all off, you'll learn my couple system and how it helps you to play all of your favorite worship songs by ear. Many people get discouraged when learning new material but if you can simply think of chord progressions as small couples (just two chords at a time), you'll immediately understand how songs and progressions work! Close-ups, repetition, and multiple views to make sure you're playing the right "fill-ins" and progressions with the right fingers. This video wasn't just put together. It was designed specifically to make sure you understand all of the techniques from a visual and mental standpoint. Learn, step-by-step, how to transition from praise music into worship with various chords and fill-ins. Almost every chord that I'll be introducing to you can serve this purpose but I'll specifically show you what chords sound the best! How to use "altered chords" in worship songs to create a variety of progressions. I cover a host of altered chords for use during "2-5-1" and "1-3-6" chord progressions. These will add even more flavor to your playing --- GUARANTEED. * How to get started the right way. Discover the most effective way to study the GospelKeys 202 Series! Learn how to maximize your practice time and how to focus on the things that count the most. * Get an overview of each disc and learn what it takes to master each part of the course! You'll set goals and commit to studying each section, one part at a time. You'll also determine what speed is best for you according to the author's instructions! * A link will be sent via e-mail where you can download or play the audio file online. * How to quickly and easily transpose any worship chord in your head... instantly! Learn the secrets to playing all your favorite songs in every key. Once you know this information, you'll never have to spend hours slowly "moving" your song to other keys ever again! * How to master a major key you've never played in. By understanding chord roles and how they differ in each key, you can easily play any song --- even if you've never played in that major key before! This is only available to the first 175 to order (either online or by phone). * Hear Jermaine's personal story and what it took to get to where he is now (both musically and professionally). * See bloopers and fun footage (purely entertaining, of course). We're talking 5 hours of step-by-step, over-the-shoulder instruction (with bonuses)! If you're serious about playing all of your favorite worship songs by ear, then you won't have a problem with this deal at all. In fact, you will love this offer because not only am I dropping the price of this course a considerable amount, but if you order today, I'm throwing in all the bonuses above which means you'll have unlimited access to audio lectures (45 minutes worth) plus the bonus 45 minute dvd interview and extra footage... not to mention the 3 instructional discs (totaling 5+ hours alone)! Plus, you'll get the additional 3 Monthly Music MentorTM courses valued at $79.95. So you're not only getting 5+ hours of step-by-step dvd footage on contemporary worship music but an additional 4.5 hours of audio training in free bonuses. Then there's the ongoing support --- what else could you possibly ask for? For all of this, I could very well charge over $200.00 and still get tons of orders for all four dvds, the additional bonus courses, and the online audio lessons. With values at $39.95 for each dvd (which is actually cheap in this instructional industry), that price would be well justified. But I'm not going to charge you $200.00 for the 5-hour set. I'm not going to even charge you $100.00. For just 2 easy monthly payments of $40, this entire GospelKeysTM 202 Training Program plus all of the bonus courses (9.5 hours combined) can be yours. This offer is subject to change at any time so if you're really interested in this video program, I suggest you act quickly --- otherwise, you might end up paying $180 or even $200 in the future. Even though the price is extremely reasonable (about the cost of two or three tickets to a local carnival), here's what's really important. If this program was just another useless course that just sat in your bookshelf and didn't teach you anything new, it wouldn't matter what the price was. IT WOULDN'T BE WORTH ONE SILVER DIME. But if you can learn just 35 new worship songs, chords, arrangements, tricks, fill-ins, and "runs", what is that actually worth to you? If you'll finally be able to play for your church like you've been desiring to, what is this course worth to you? I can't put an exact dollar figure on it for you --- only you can do that. But I can tell you this: at 2 monthly payments of $40 (...only $16 an hour), this program could possibly be the best bargain and the best investment you'll ever make towards your musical growth. So not only do you get the flexible payment plan, but you have a full year to decide whether this course is for you. At 2 monthly payments of $40, you are losing absolutely nothing and the risk is all on me. What else can I say? I've acted on my end of the deal ... now it's your call. If you think 2 payments of $40 is too much for you, then ask yourself this question: "How fast will I spend this money on *extra* clothes and shoes that I don't even need?" Some of you can't honestly answer more than 2 hours depending on the department store. I know I can't. I am trying to literally give you 5 hours (300 minutes) that will change your piano playing forever. No one knows your condition like you do. Do you honestly need help with worship songs? Are you struggling to learn new songs? The video course is shipped via USPS Priority Mail. You will receive the GospelKeysTM 202 *Special Edition* dvd course in a week or so (depending on the shipping options available) and you can get started learning worship songs the very same day you receive it. You can literally be on your way to playing for your church service (or improving your current skills) by the end of next week! P.S. Don't forget --- I am including bonus disc 4 (an additional $25 value), online audio lectures (45 minutes total valued at $43.00), and 3 bonus Monthly Music Mentor courses (valued at $79.95) with this special offer. I honestly don't know how long this will last. All I can say is if you're serious about playing gospel music, you'll want to take advantage of this special offer while you can. Otherwise, you might be one of those individuals who pay more than $200 for all four training discs. To receive your copy of the comprehensive GospelKeysTM 202 Training program, Click here. P.P.S. Still not convinced that you need this gospel video course? Let me give you just one more reason to order. If you find yourself pausing or being silent between chords, then you're not fully utilizing the power of "fill-in" chords. I don't mean to insult you in any way. I just want to let you know that there is room for improvement for anyone (no one is excluded when it comes to growth). If you want to grow in your musical ability, click here to order now. With my 365-day unconditional money-back guarantee, you have absolutely nothing to lose.